Physiotherapists are qualified to assess and fit orthotics to individuals requiring orthotic support for compromised foot and lower limb biomechanics. Move Forward Physiotherapists may prescribe GaitScan orthotics which are individually assessed and formatted for each patient. Heat moulded orthotics are a cost effective solution for many patients requiring orthotic control on a temporary basis. Heat moulded orthotics last for approximately one year in an active individual (longer for a sedentary person) and can be purchased in a variety of shapes and sizes, but must be correctly fitted by the physiotherapist. 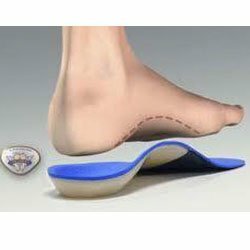 These orthotics are ideal for children who have growing feet and may require a new pair every 12 to 18 months, or for adults requiring short term orthotic control for mild or short term conditions, such as acute planter fasciitis or post surgical, or for minor foot discomfort due to arthritic changes. The orthotics come in full length or ¾ length, soft (for diabetic elderly patients) to firm (sporting population), flexible or rigid control (the physiotherapist will determine the degree of control required), and even in models suitable for wearing with high healed shoes. What is the GaitScan Orthotic System? The GaitScan Orthotic System is a computer operated force plate that assesses the biomechanics of the foot during the gait cycle (functional) as well as in the standing position (non-functional). Together with the physical assessment already performed by the physiotherapist, the information recorded during the force plate assessment assists in the development of a pair of orthotics most suitable to correct the dysfunction for that individual. The physiotherapist determines what, if any, additions are required (such as a cut out for a plantarflexed first toe or a metatarsal dome) and the information is emailed to a laboratory interstate. The orthotics arrive approximately one week later and are then fitted by the physiotherapist who can arrange alterations if required. These orthotics also come in a variety of shapes, lengths and widths to allow comfortable fitting in a variety of shoes or for any circumstances. Patients will often order several pairs – one for work shoes, one for sporting shoes, and one for their high heals. The Orthotic Group website can be found at http://www.theorthoticgroup.com if you wish to learn more about this orthotic system. There are many foot dysfunctions that may benefit from orthotic control, the most common being over-pronators. Over pronation has been linked to a variety of lower limb dysfunctions, including plantar fasciitis, Achilles Tendonitis, Tibialis Posterior Tenditinitis, patello-femoral pain, talo-naviclaur joint inflammation, plantarflexion dysfunction of the first toe (arthritic changes), and even changes in the range of motion of the hip due to muscle imbalances.